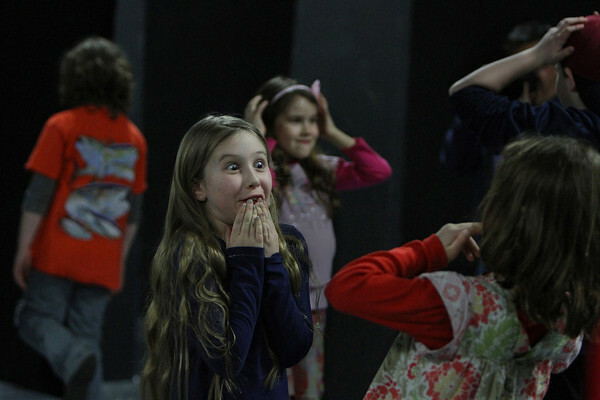 Eight-year-old Gabrielle Cros of Gloucester reacts to her friend Faye Grandon (right foreground), also 8 and from Gloucester, during a "mirror" exercise recently during the Gloucester Stage Youth Acting Workshops. The program, taught by actress Heidi Dallin of Gloucester, is designed to provide young actors, 6 through 18 years of age, an outlet to nurture their creative potential through the development of self confidence, communication and teamwork skills. The winter session has just ended, but the summer 2014 session is scheduled to begin on July 11.